Personnel – Melanie Dyer: viola; Charles Burnham: violin; Gwen Laster: violin; Tomeka Reid: cello; Ken Filiano: bass; Brandon Lopez: bass; Michael Wimberly: djembe and trap set. 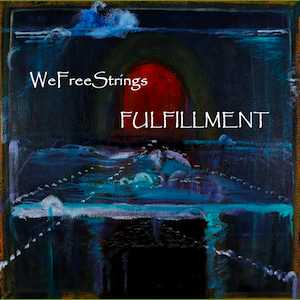 Combining written lines and spontaneous interjections with expertise, the string sextet WeFreeStrings, named after Rahsaan Roland Kirk’s album We Free Kings, showcases five original compositions and six ‘paraphrases’ (collective improvisations that pay tribute to important free thinkers and artists) on their debut recording, Fulfillment. The classically trained violist Melanie Dyer spearheads the group, which effortlessly provides a certain degree of avant-gardism within an organized musical setting. Violinists Charles Burnham and Gwen Laster, cellist Tomeka Reid, bassists Ken Filiano and Brandon Lopez, who take turns, and percussionist Michael Wimberly, catch up on Dyer’s interesting personal ideas, turning them into positive collective synergy. Multi-toned statements, lyric and hopeful, set “Hope & Fulfillment” in motion. The resultant chamber reflection on womanhood takes a more joyful direction as the tune advances. Also waltzing and centered on the womanhood topic, “I’m Still Here” employs both diatonic and atonal segments, featuring efficiently smooth improvisations. Evoking the rhythm of Harlem, “So(u)lstice Song” is brought up with tension before embarking on a Herbie Nichols style that comprises a bump-free swinging rhythm, intelligible melodic lines (unison or isolated), and a deep sense of freedom. Inspired by Sonny and Linda Sharrock’s “Black Woman”, “After Linda, Say Her Name” sets a folk melody against flickering texture while the band members say the names of black women who tragically died due to police/mob violence in the US. “Bayaka/Yangissa”, a traditional Batwa song from the Congo rainforest, denotes a lovely blend of world music and avant-jazz, whose spirituality and rhythmic flow encourage everyone to fight and pray for a better world. Tempo is shifted with ease in the last two and a half minutes, with a groove in five supplanting the prior cadence in six, which later regains the command. This particular piece demonstrates some affinity with violinist Billy Bang, one of the free artists revered on the short, collectively composed ’paraphrases’. Sun Ra, Leroy Jenkins, and Ornette Coleman are other honorees whose artistic impact inspired moods ranging from sinister laments to exultations to extremely percussive tracts with chirping puncture and colorful tonalities. Fulfillment is a solid first effort from a promising, socially conscious ensemble that knows which direction to take.